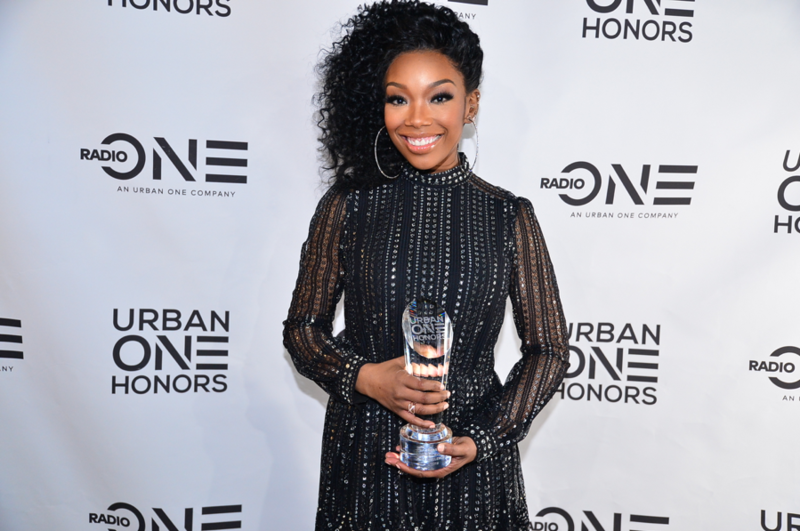 On December 9, 2018, Urban One hosted the inaugural URBAN ONE HONORS Awards show at The Anthem in Washington, DC. The star-studded show, hosted by comedian and REACH Media personality D.L. Hughley, honored Jermaine Dupri, April Ryan, Brandy, Tom Joyner, Marvin Sapp, DJ Khaled, June Ambrose, Doc Walker, Shaun King, Benny Pough, Congresswoman Eleanor Holmes Norton, Jade Novah, Dr. Nadia Lopez, Tracy Martin, Sybrina Fulton and Rotimi. Presented by MGM National Harbor and Radio One’s Washington D.C. radio stations Majic 102.3 & 92.7, 93.9 WKYS, Praise 104.1, WOL 1450 & 95.9, Spirit 1340 and The Team 980, the event was developed to acknowledge and honor individuals or organizations that have made an extraordinary impact on society and culture. 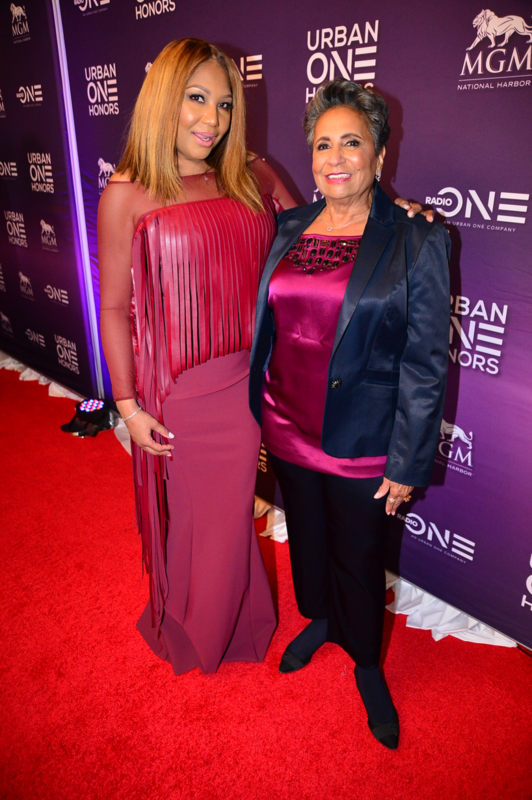 Traci Braxton poses for a photo with Chairperson of Urban One Inc., Cathy Hughes, at the Urban One Honors event on December 9th at The Anthem in Washington D.C.
Honoree Brandy poses for a photo after receiving her award at the Urban One Honors event on December 9th at The Anthem in Washington D.C.
Beginning with a hilarious welcome from the King of Comedy host, D.L. Hughley, the highlights of the evening included powerful musical tributes, moving speeches and calls-to-action for political, educational and social change. Cathy Hughes also welcomed and thanked attendees for supporting the inaugural event and celebrating the honorees. Honoree June Ambrose the Urban One Honors event on December 9th at The Anthem in Washington D.C. Performer Elle Varner kicked off the evening with an upbeat medley of her songs, including the hit, “Refill” and new single “Loving U Blind,” which got the crowd rocking early. 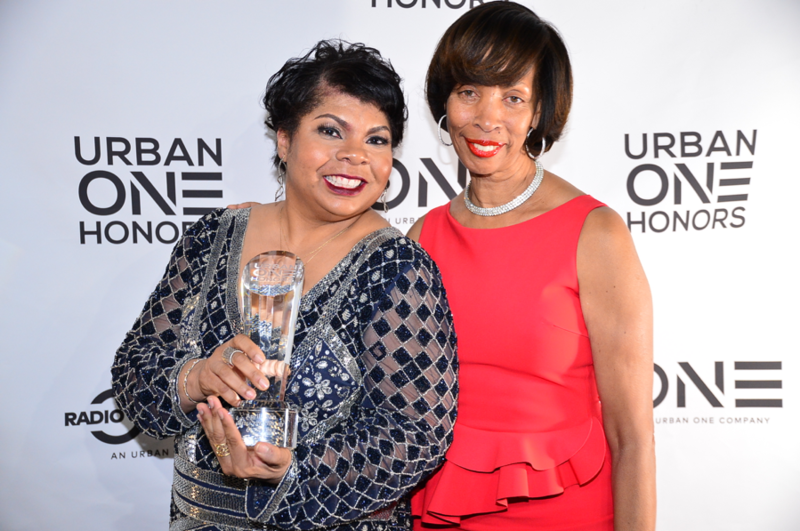 Mayor Catherine Pugh, Baltimore, MD poses with honoree April Ryan at the Urban One Honors event on December 9th at The Anthem in Washington D.C.
Radio Veteran and REACH Media’s own Tom Joyner was presented the Lifetime Achievement Award by Cathy Hughes and Phyllis James, Chief Diversity Officer at MGM, who helped to sponsor the evening. “When I think of lifetime achievement, I think of someone who dedicates themselves to the advancement of others and works tirelessly to enhance society. When nominees were being considered, Tom Joyner stood above all others, because he is without equal,” stated Ms. Hughes. Joyner was also celebrated by his fraternity, Omega Psi Phi, with a high-energy step show performance. 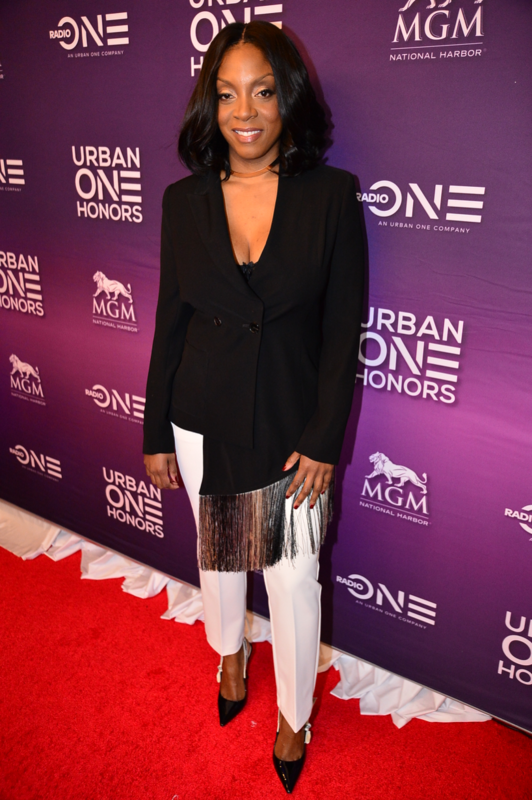 Honoree Dr. Nadia Lopez at the Urban One Honors event on December 9th at The Anthem in Washington D.C. The soulful Avery Sunshine brought the house down with a stellar Aretha Franklin tribute. She performed “Daydreaming,” while accompanying herself on piano, “I Never Loved a Man the Way I Love You” and “Jump To It.” R&B crooner Johnny Gill also took the stage, handing out red roses as he performed his classic “My, My, My,” along with some of his other hit songs. Following his acceptance of the Inspirational Impact Award from son Jamar Sapp and Griff, co-host of “Get Up Mornings with Erica Campbell,” Pastor and Gospel singing sensation Marvin Sapp delivered a soul stirring performance of his songs, “Never Would Have Made It,” and “The Best In Me.” Keeping the momentum going, K-Ci of Jodeci had the crowd on its feet, as he performed “Forever My Lady,” which he dedicated to the late Kim Porter, followed by his remake of the Bobby Womack classic "If You Think You're Lonely Now." Dr. Michael Eric Dyson, who presented the Global Ambassador Award to Tracy Martin, activist and father of Trayvon Martin, drew an enthusiastic response when he delivered his own version shortly after, meant for the current occupant of the White House. "If you think you're lonely now," he crooned, " wait until impeachment." 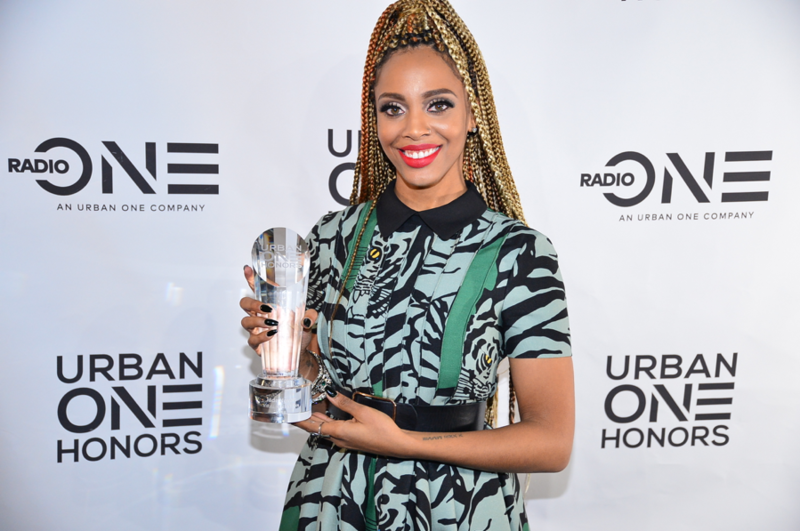 Baltimore MayorHonoree Jade Novah poses with her award at the Urban One Honors event on December 9th at The Anthem in Washington D.C.
Catherine Pugh presented Baltimore native, journalist and author April Ryan with the Media Personality of the Year Award. “As the Bureau Chief for American Urban Radio Networks and a White House correspondent, she faces adversity with a calmness that makes our president take pause,” Mayor Pugh said of the accomplished journalist. Baltimore State’s Attorney, Marilyn Mosby was also in attendance and presented the Education Maven Award to Dr. Nadia Lopez, who urged the audience to support the educators fighting daily. The night closed out with Jermaine Dupri receiving the Living Legend Award, presented to him by longtime friends Da Brat and Bryan Michael Cox. DJ Nabs played a tribute mix, which included some of Jermaine’s greatest hits from Mariah Carey, Usher, Da Brat, Kriss Kross, Xscape, Bow Wow and more. Other honorees and presenters included: June Ambrose, recipient of the Fashion Icon Award, presented by Q Parker; Shaun King received the Social Change Agent Award, presented by Symone Sanders; LA Reid presented Roc Nation President Benny Pough with the Record Executive of the Year honor; Roland Martin presented Congresswoman Eleanor Holmes Norton with the Public Servant Award; Rotimi was honored with the Generation Next Award by Traci Braxton; DJ Khaled accepted the Hip Hop Impact Award via video message ; Fred Smoot presented the Sports Legend Award to Doc Walker, and recording artist Jade Novah received the Viral Sensation award presented by Gia Peppers. Representing excellence in the areas of innovative programming, successful business ventures, advanced technology, entertainment, social activism, education, and community service, through diligence and dedication, this inaugural class of URBAN ONE HONORS recipients has set the bar high while being an exemplary catalyst for change and profound models for success. The show will premiere on TV One in 2019. Yes, there were some very smart and cool ladies there. Lisa Johnson and 5 others upvoted this.